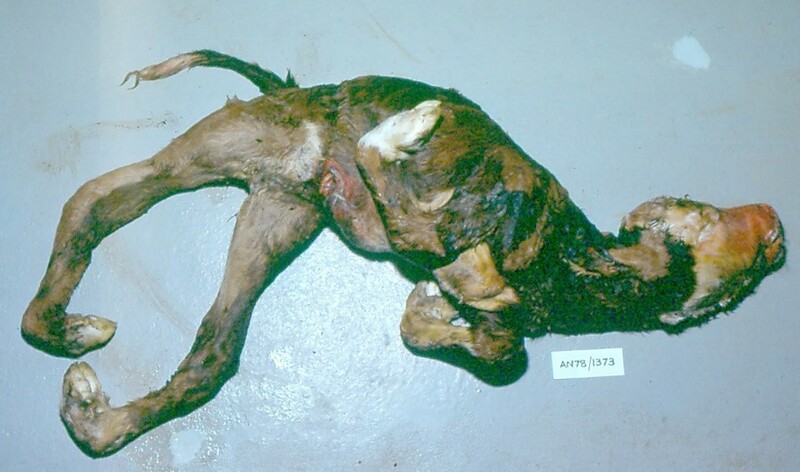 Akabane disease of cattle, sheep and goats is caused by infection with Akabane virus, a Bunyavirus. Reported from the Far East, Australia, the Middle East and Africa. Infection of the dam causes abortion or defects in the fetus, with skeletal abnormalities and hydranencephaly as the principle findings in fetuses and newborn. Spread by the biting insect CULICOIDES. The signs other than abortion and decreased milk yield listed below are seen in the offspring not the mother. The Bunyavirus Aino virus belongs to the same genus as Akabane virus and is a potential teratogenic pathogen that has been serologically linked to congenital malformations in Japanese calves. Akabane is an insect-transmitted virus that causes congenital abnormalities of the CNS in ruminants. Disease due to Akabane virus has been recognized in Australia, Israel, Japan, and Korea; antibodies to it have been found in a number of countries in southeast Asia, the Middle East, and Africa. 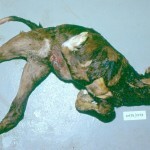 The disease affects fetuses of cattle, sheep, and goats. Asymptomatic infection has been demonstrated serologically in horses, buffalo, and deer (but not in humans or pigs) in endemic areas.